KIEV, Ukraine -- Corruption and corporate raiding are growing at an alarming rate in Ukraine since Viktor Yanukovych came to power. 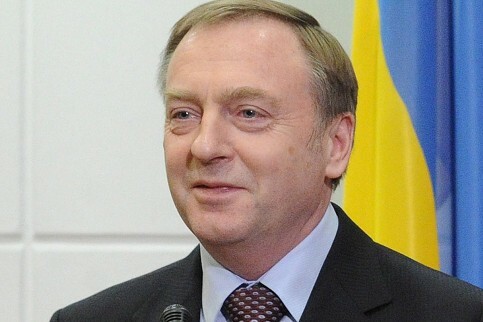 Ukrainian Minister of Justice Oleksandr Lavrynovych. The country dropped 18 places this year in Transparency International’s annual rankings, now standing below Russia and Azerbaijan (both 143) and in 152nd place alongside Congo, the Central African Republic and Tajikistan. Moreover, 152nd place corresponds to 2.3 on the 10 point scale in Transparency International’s Corruption Perception Index. They found President Viktor Yanukovych had not undertaken any noticeable fight against corruption, which remained virtual. By contrast, Georgia has made tremendous strides in rooting out corruption – especially in the police and judicial system. In 2011, Transparency International ranked Georgia 64th (compared to Ukraine’s 152nd) showing how political will in combating corruption in Georgia since the 2003 Rose Revolution has improved the situation. Ukraine, following the 2004 Orange Revolution, failed to replace the Soviet justice system or combat corruption except in 2005, by the first Tymoshenko government. Georgia (64th) is ranked better than old EU members Italy (69) and Greece (80) and new EU members Romania (75) and Bulgaria (86) and sits alongside Slovakia (66) and Hungary (54). Ukraine dropped to 152nd place (out of 183) in the International Finance Corporation (IFC) and World Bank’s 2011 Ease of Doing Business index, because of growing corruption and corporate raiding. The proportion of businessmen who use unofficial methods to deal with the authorities has grown from 35 percent to 46 percent and their expenditure on corruption had increased from 6 percent to 10 percent of their budgets. The nature of corporate raiding is changing. In the past, businessmen used corrupt judges to change ownership deeds, but increasingly law enforcement structures are illegally taking over businesses. The Yanukovych administration argues that Yulia Tymoshenko’s sentence, and the arrest of Yuriy Lutsenko and other “Orange” leaders and officials is part of an anti-corruption drive that has arrested hundreds of officials. The list of arrested officials has never been revealed and it has not halted the growth of corruption. Justice is applied selectively and in relation to the level of one’s political obedience. While Tymoshenko is in jail for allegedly bringing losses of $190 million to the state, Kiev Mayor Leonid Chernovetsky and his associates remain free. Yet, the extent of their corruption is beyond doubt in the biggest land grab since Ukraine became an independent state. Kiev’s city governor (presidential representative) Oleksandr Popov reported that they had returned 1,700 hectares of land illegally distributed by the Mayor’s office. Asked if Chernovetsky and his subordinates would be punished for mass corruption, Popov said this was a question to be addressed to the prosecutor’s office. When asked if the prosecutor’s office had opened cases against Chernovetsky First Deputy Proseutor Renat Kuzmin replied “Never”. Asked if there were criminal cases outstanding against the former President Viktor Yushchenko, Kuzmin replied that there never had been. Yushchenko defended Chernovetsky in the 2008 pre-term mayoral elections against Tymoshenko’s attempts to unseat him. Yushchenko supported the 2006 gas contract, even though it is little different to the 2009 gas contract for which Tymoshenko has been sentenced. He also supports her prison sentence. Ukraine continues to include Soviet era articles in its 2001 criminal code, one of which was used to imprison Tymoshenko. As EU leaders have stated, these articles are not included in any European country’s criminal codes. In 2008, Georgia purged its Soviet-era Criminal Code with a new Criminal Proceedings Code that is fully adversarial, has clear standards of evidence, preference for non-custodial sentences in pre-trial situations and introduced trial by jury. The rationale for jury trials was put by Levan Ramishvili, the Director of the Liberty Institute, “It is harder to pressure 12 people than it is to pressure one judge”. Ukraine has no framework for jury trials and operates under the Soviet system, where the prosecutor is all powerful and the judge is an arbiter. Ukraine’s prosecutor’s office remains a Soviet institution that has been turned by the Yanukovych administration into an arm of state political repression. The aim is to punish – not administer justice. This was seen in the Tymoshenko trial through the use of a small court room in summer and an inexperienced judge, an over-crowded jail and the denial of medical care. Yanukovych’s understanding of “justice” is selective and characterized by observers as “thuggish machismo”. Yanukovych’s attitudes to the rule of law could be seen when he offered to Chancellor Angela Merkel that he would release Tymoshenko if she paid a $190 million fine. He joked to the Russian Prime Minister, Vladimir Putin that he would release her on her birthday and Party of Regions deputies offered on television to exchange Tymoshenko for former Prime Minister Pavlo Lazarenko, who was imprisoned in 2006 by a Californian court. Viktoriya Sumar explains the reasons for the demonstrative brutality: “Yes, they [the authorities] are afraid. But, by carefully hiding their own fear they are trying to impose fear on us. Who wants to be in opposition? Who wants to become a viable alternative? If you do, the same could happen to you...Hence the irrational and demonstrative cruelty. Human dignity does not enter into their calculations”. In Georgia, sweeping public sector reforms led to the entire justice system becoming transformed. From 2003-2010 prosecutions took place of 1,064 policemen, 109 investigators, 20 prosecutors and 30 judges. During the same period Georgia’s prison population swelled from 6,274 to 23,789 as the administration’s anti-corruption drive bore fruit. Many long-serving judges were sacked in Georgia and a new generation of young judges was appointed who had received Western education. The salaries of public officials, including policemen, prosecutors and judges were hiked, reducing incentives to take bribes. A zero-tolerance policy towards corruption was adopted and new standards introduced, including a written examination for judges. As in George Orwell’s novel Animal Farm, in Yanukovych’s Ukraine everybody is equal, but some are more equal than others.